It’s time again for one of my favorite parties celebrating the musical legacy of the king of pop: Michael Jackson. 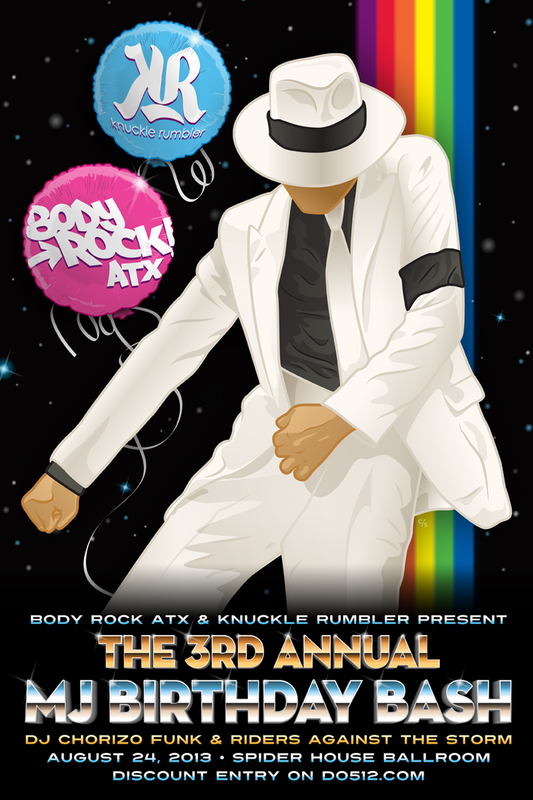 This is the 3rd edition of Body Rock Atx’s annual MJ B’Day Bash and just like last year we are teaming up with Knuckle Rumbler to throw a party fit for a king! RSVP on Do512 for reduced cover here || FB link here. There isn’t much for me to add about MJ, but I am including a youtube clip below that I hadn’t seen before and a free mix for DL. Here’s a 20/20 feature on MJ and his brothers which originally aired in 1980 I believe. It has some amazing footage from the Jacksons touring in 1980 after the release of Off the Wall.